Burgums and Burghams of the "FF" family tree, "RR" family tree and "UU" family tree lived here, or nearby. ABENHALL ST MICHAEL (and All Angels) was built of local red sandstone. The original Norman chapel-of-ease was added to in the 1300’s by the addition of a nave and the south aisle, with the addition of the tower min the 15th century. It was restored in 1874. Forest of Dean industries are reflected by the arms of the Freeminers (on the west wall) and the amazing octagonal font, which has carvings of tools belonging to miners and ironworkers who worked in the area. The arms of the free miners are also represented on a modern carving of a shield on the outside west wall of the tower. The churchyard had become full by 1911 and Katherine Alice Barton, who owned an adjacent one third of an acre of orchard, gifted it to the church. Elizabeth Burgum died age 72 and was buried in the churchyard on 10th November 1913. (Old plot no. 40; new plot no. 53). There is no headstone. Elizabeth Burgum died age 72 and was buried in the churchyard on 10th November 1913. (Old plot no. 40; new plot no. 53). George Burgum died age 73 and was buried in the churchyard on 19th January 1923. (Old plot no. 40; new plot no. 53). Neither have a headstone. James Burgum (CS1851-13) was born at Aston Ingham and worked (1851) as a cooper. Having lived with his wife Ann (Haskins) Burgum at Taynton, by 1851 they had moved to The Cross, at Abenhall. They had children Mary Ann Burgum (dau), Emily Burgum (dau) and Frances Burgum (dau). Later they moved to Mitcheldean (CS1871-63). The list below shows the baptisms, marriages and burials that took place at Abenhall. Richard Burgen 04 Jun 1629 Abenhall Marriage m=Frances Curtis FF? Richard Burgem 21 Apr 1643 Abenhall Burial m=Frances Curtis FF? Jane Bergham 22 May 1822 Abenhall Marriage John Newport m=William Lodge FF? 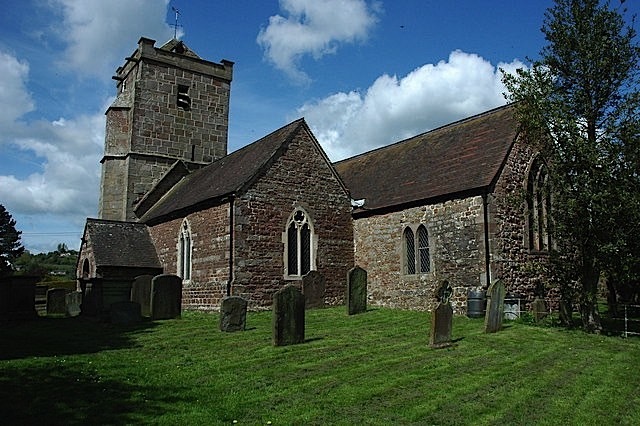 (1) Richard Hall was educated at Hart Hall, Oxford and became a deacon in 1668 and a priest in 1670. was rector of Mitcheldean, but also held Abenhall from 1685 until his death in on 16th March 1723. (2) John Probyn was born in Newland and educated at Christ Church, Oxford. He was presented in 1785 by his father (from whom he later acquired the manor). He later became archdeacon of Llandaff, Gmaorganshire, but lived in Newland, where he became vicar for a short time, and later in Longhope, where he was a landowner. Abenhall was often served for him by curates, including from 1813 his son Edmund, to whom he gave the rectory in 1827. He died 4th October 1843. (3) Rev. James Davies was educated at Oriel College, Oxford and was incumbent at Abenhall from 1837. He was still there in 1863 (Kellys Gloucestershire Directory) when the living was a rectory, a value £140 per year and 25 acres of glebe land. (4) J. W. Gregg was rector and patron at Abenhall and inaugurated a fund for the church to be restored to designs by A. W. Maberly in 1874. The restoration included the removal of the ceiling and a west gallery was removed from the nave and a vestry built. (5) Reverend H.H. Hardy was rector at both Mitcheldean and Abenhall. The east window of the chancel at Mitcheldean Church was fitted with stained glass in 1905 to commemorate him following his death in 1904. (6) Rev. E. Cargill was educated at St John's College, Cambridge and became rector of Abenhall in 1890, having previously served at Kenley, in Shropshire. He resigned from Abenhall 1910. He died, age 79, in 1920 and was buried in Cheltenham Cemetery. (7) Rev. Charles Richard Pollock, formerly curate of Homer Vicarage, Hereford, was appointed to the rectory at Abenhall in 1910. Click here for more about Abenhall and some of the Burgums and Burghams who lived there.